A Croatian general charged with war crimes has been arrested in Spain, the UN's chief war crimes prosecutor says. Ante Gotovina - the third most-wanted suspect from the Balkan wars - was held in the Canary Islands on Wednesday. Gen Gotovina, 50, is accused over the death of about 150 Serb civilians during a Croatian offensive in 1995. He has been jailed by a Spanish judge and could be extradited to The Hague as early as Friday. His lawyer said his client would probably plead not guilty. He has denied responsibility in the past, his lawyer added. The Croatian government's failure to arrest the general had hampered the country's entry talks with the European Union. UN prosecutor Carla Del Ponte said she hoped efforts would now be stepped up to arrest the top two men on the tribunal's most-wanted list. Former Bosnian Serb leader Radovan Karadzic and his military commander Ratko Mladic remain at large. Ms Del Ponte announced Gen Gotovina's arrest during a visit in the Serbian capital, Belgrade. He was held in a hotel in the Tenerife resort of Playa de las Americas on Wednesday night after being followed for several days, the Spanish news agency Efe reported. The retired general was said to be in possession of a false Croatian passport with an assumed name, said Efe quoting the Spanish interior ministry. He was flown to Madrid on Thursday and taken to the High Court, where a judge read him the charges against him. Gen Gotovina was indicted for crimes against humanity by the war crimes tribunal in 2001. He is alleged to have failed to prevent the murder of 150 Serbs killed by shooting, stabbing or burning during Operation Storm, the August 1995 push against Serb forces in Croatia's Krajina region. The indictment also accuses him of co-ordinating a campaign of plunder and looting throughout operations in ethnically Serb areas of the region. Throughout the tribunal's efforts to track him down, Gen Gotovina, has maintained support from a wide section of the Croatian public, some of whom regard him as a national hero. He was sent into early retirement in 2000 when Croatia promised to investigate allegations of war crimes among its military during the 1990s. Croatia had claimed that he subsequently fled the country. He vowed never to turn himself in. 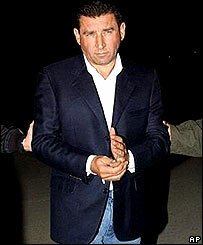 Croatian Prime Minister Ivo Sanader said the arrest proved that Croatia was right when it said Gen Gotovina had fled abroad. In Brussels, Nato Secretary General Jaap de Hoop Scheffer described the arrest as "good news for the world, for bringing people to justice who are not yet convicted but are accused of very serious crimes". Serbian President Boris Tadic congratulated Croatia on Gotovina's arrest. But Belgrade reiterated that it had no knowledge of the whereabouts of the two key Bosnian Serb fugitives.